The Law Portal combines several different collections of Virginia Laws. The homepage provides an overview of the contents of each collection. Use the homepage to select a collection. Each collection has a landing page that shows the table of contents for the collection. Depending on the collection, there may be additional levels of organization presented in a secondary table of contents page. From there you can drill down into the details for the collection. The site features easy navigation to move both between and within collections. You can use the previous/next arrows to move to the previous or next record. For the Code of Virginia and the Virginia Administrative Code (VAC), this can be Title, Chapter, or Section, depending on which level you are viewing. Near the top of each details page, under the collection name, you will see “breadcrumb” links. You can use the breadcrumb links to move back to any level in the current section’s hierarchy. You can also use the URL to go directly to the record you are looking for. Simply replace section number with the actual section number. http://law.lis.virginia.gov/vacode/section number, for the Code of Virginia. http://law.lis.virginia.gov/admincode/section number, for the Virginia Administrative Code. You can use the left sidebar to view a different collection. Click the name of the collection in the left sidebar to view the table of contents for the collection. The Code of Virginia left sidebar also contains a link to the Popular Names list. Here you will see well-known Acts of Assembly referred to by their common names, such as the Condominium Act or the Line of Duty Act. Under Virginia Administrative Code in the left sidebar, there is a link to View Regulations by Agency. From this page, you can select an agency to view regulations produced by that agency. 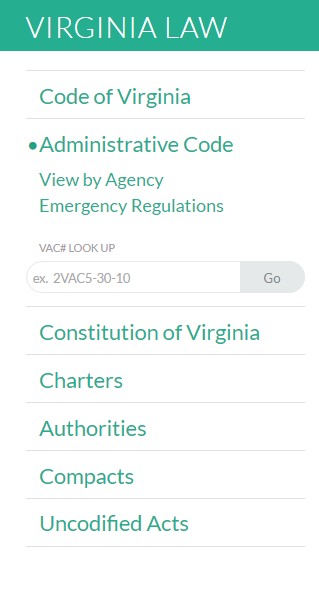 Also in the left sidebar for the VAC is a link to view Emergency Regulations, which takes you to the emergency regulations list on the Register of Regulations website. For the Code of Virginia and Virginia Administrative Code, the left sidebar also includes Look Up boxes. Enter a section number in the Look Up box to go directly to an individual code or regulation section. You can also enter a Title number to view the table of contents for a particular Title.